Montserrat is a fantastic location for a stay, whether one is a devout believer or not. We wanted to spend a couple of days on the mountain so we booked the apartments as they or the hostal are the only options. The check in was easy and the staff were very pleasant. Location was great. Room was big and clean. Basic accommodation but price was definitely good value. We wanted to stay in Montserrat and we enjoyed the early mornings and evenings without the crowds. Quite simply, one of the most amazing locations in the world. Bring some groceries So you can save money on food and stay longer. The location and the spaciousness. I was easy walking distance from the Monastery and Basilica and that was important to me since I spent times there several times a day. Also proximity to the mountain hiking trails. The mountain views from my living room window. I am an author and loved to sit by that window when writing. The view of the busy tourist areas below my window. The view and size of the apartment was wonderful. Kitchen full of appliances. Hiking around the site. The apartment was BIG and very nice; however, the kitchen had no basic supplies, e.g., salt. Since we only stayed two nights we didn't really want to buy the needed supplies. Also, there really isn't a grocery store in Montserrat; there were a few supplies available for sale. Except for the big hotel there is no last meal of the day available. It should be noted in advertising that one must go to the hotel front desk for the keys to the apartment. In April at least Montserrat seems to totally empties out of visitors at night. We happened upon two long walks in nature: one along a trail extending out of the far end of town (away from the train station with many small shrines along the way) and the other going up the tall hill/mountain behind the train station. The view of the valley below is incredible WHEN the valley isn't covered by clouds. I valued being able to make several visits to the cathedral to better get "a feel" for it. Lovely and helpful staff! 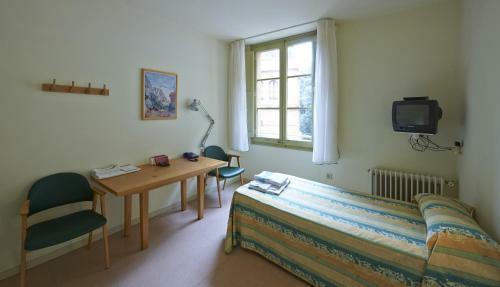 Huge room with separate living room, great view to the mountains, discount for groceries and we had kitchen, that was perfect! Lock in a great price for Apartamentos Montserrat Abat Marcet – rated 8.3 by recent guests! Offering a dramatic hilltop setting next to Montserrat Monastery, Apartamentos Montserrat Abat Marcet features well-equipped studios and apartments. They overlook the surrounding Muntanya de Montserrat National Park. Each apartment and studio at Apartamentos Montserrat Abat Marcet has simple, bright décor and heating. The seating area includes a TV, and the kitchenette has a microwave, fridge, oven and gas hob. Montserrat Abat’s à la carte restaurant offers traditional Catalan dishes. 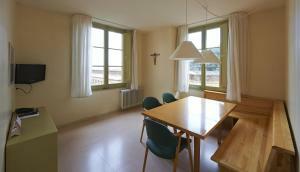 Set in Plaça Abat Oliba Square, the property has easy access to the monastery’s shops and cafés. The rack railway station is just 150 feet away and there are regular trains to Monistrol-Vila. Terrassa is 22 mi from the property. 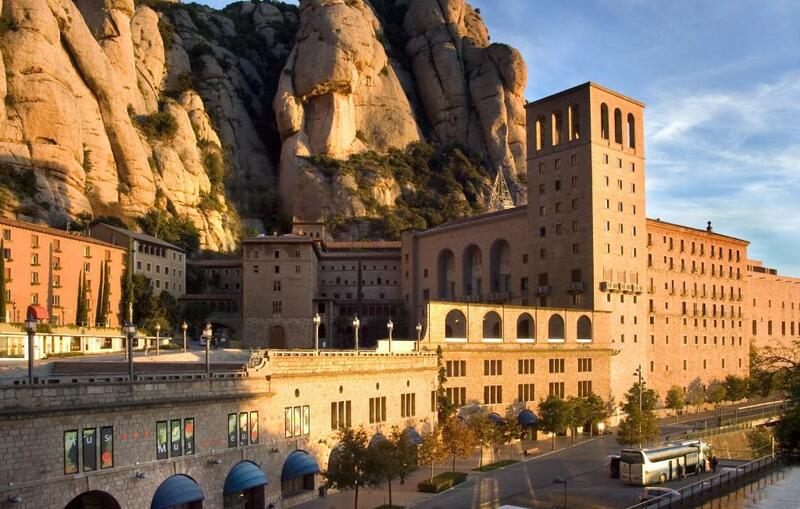 When would you like to stay at Apartamentos Montserrat Abat Marcet? Offering mountain views, this studio has simple, bright décor and heating. 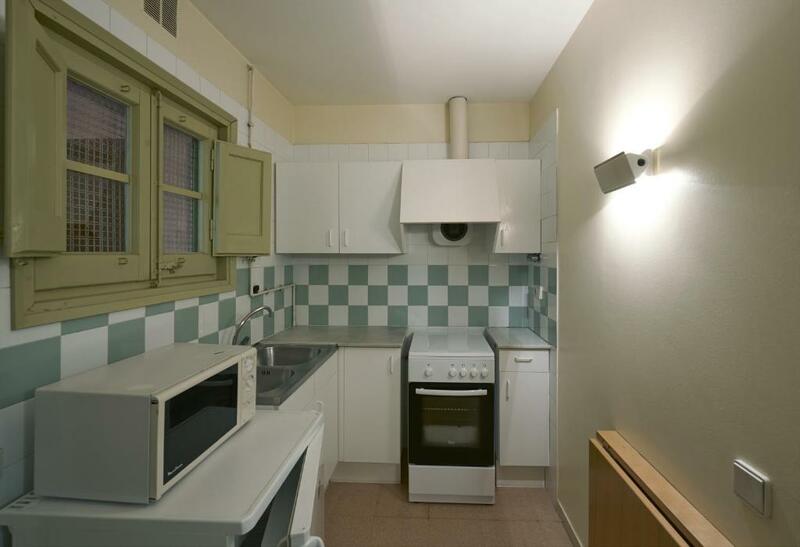 There is a single bed, a seating area with a TV, and a kitchenette with a microwave, fridge, oven and gas hob. 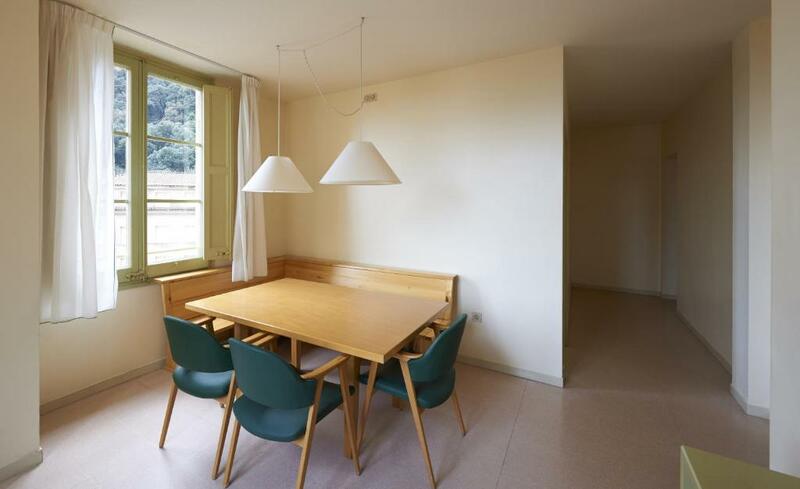 Offering mountain views, this apartment has simple, bright décor and heating. 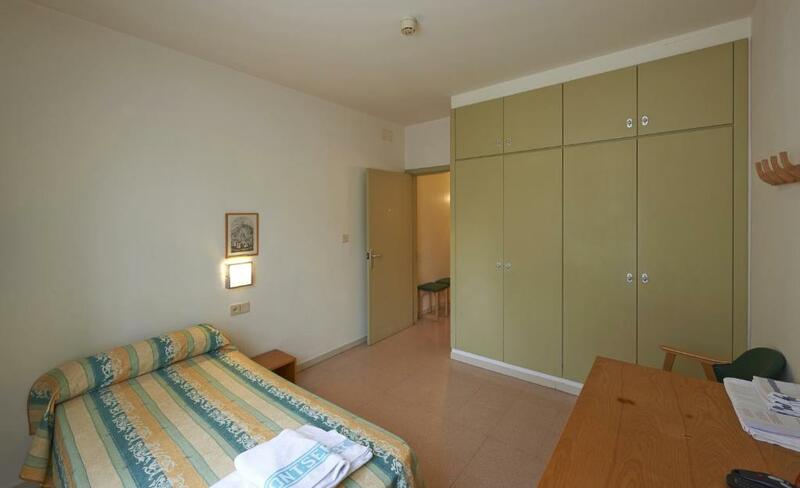 There is a twin bedroom, a seating area with a TV, and a kitchenette with a microwave, fridge, oven and gas hob. Offering mountain views, this apartment has simple, bright décor and heating. 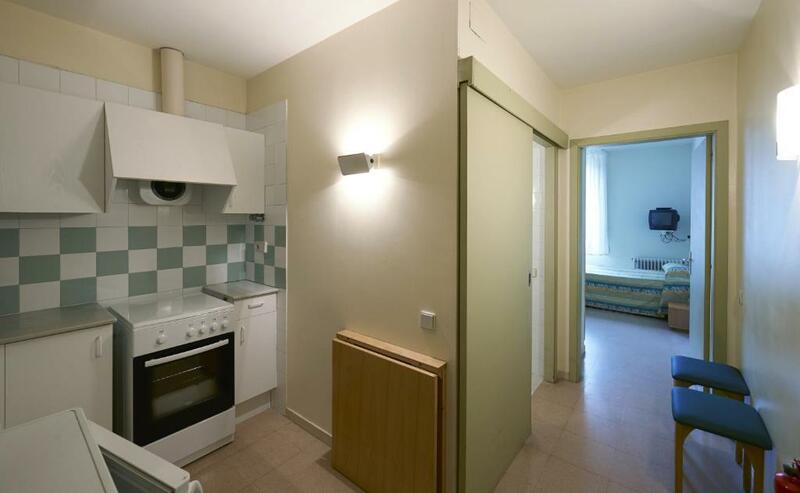 There are 2 twin bedrooms, a seating area with a TV, and a kitchenette with a microwave, fridge, oven and gas hob. House Rules Apartamentos Montserrat Abat Marcet takes special requests – add in the next step! Apartamentos Montserrat Abat Marcet accepts these cards and reserves the right to temporarily hold an amount prior to arrival. Please note that check-in and key collection take place at: Hotel Abat Cisneros, MONTSERRAT 08199. Please inform Apartamentos Montserrat Abat Marcet of your expected arrival time in advance. You can use the Special Requests box when booking, or contact the property directly using the contact details in your confirmation. There was no line at front desk at time of key pick up. The personnel at front desk was very professional&friendly at same time (prior when called they offered all kinds of directions and assistance to help us get to the property). HOWEVER, at check-in we were told that the reservation was made for 4 people and there were only 2 people in our party. So I req. that to be corrected but he (even though very nicely) advised me that he cannot because booking.com shows 4 people. Thus WE BELIEVED WE WERE OVER-CHARGED during initial reservation because we paid €80/night for the initial nights (€80= €88/night - 10% discount). On our last day, we decided to stay one extra night, front desk quoted me the €88/night. She said she cannot give us the €80 rate. I told her I will call her back after I talk to my husband. Few minutes later when called again with our decision to stay at that high €88 rate - the nice Senior who picked up the phone gave us €44/night rate for our last night (extended night) after I told him again that there are only 2 of us. He said that we qualify also because it is low season. I know I made reservations for 2 people and we never had anyone else traveling with us ever since we left USA. So I think either the property or booking.com set us up to pay the €80/night rate for the initial few nights. But still we are praising the Lord for being given the €44 for our last night and mostly for the gorgeous nature that He has made and the monuments at Montserrat, its wonderful personnel in the grocery store and the deal combination ticket at about €50/pp which allowed us to see everything*included some transportation too. Thank you to all who pray, plan and work to serve the the pilgrims and visitors! There was no matches for oven, no soap and shower gel and makeovers outside the apartment were started in early morning and it very loudly. No matches for the stove - but hotel staff provided us with them when we asked. No dish soap, no sponge - but we had read other booking.com reviews before our trip and we took this equipment with us. Spacious apartment, equipment is definitely not new - but everything is very clean. Heating worked very well (we stayed there in early March - cold nights, but it was nicely warm inside. Good value for money. The fact that there was no hairdryer and no dishwashing soap to clean up in the kirchen. The location and the kitchen equipment. There is a kitchen in the apartment. But there are no matches, no kettle, no dishwash, no cleaning cloth in the kitchen. Comfortable, very clean, great location. Kitchen utensils could be a bit better (cutting board, sharp knives), plus soap, washing liquid, sponges weren't provided, and weren't always available in the bodiga. Close to nature, and good to experience the surroundings and monastery at night when it was quiet. The beds aren't so much comfortable and the check-out is too early. The location and the views from the apartment are amazing. We had all the basic facilities there and we could ask for anything we missed to the staff and they were nice to us. We spent a really good weekend. No basic coffee/tea provided or even soap/shampoo. I understand it's more of a hostel but I think providing some soap is not asking too much. Location so close to the Basillica. View of valley and sunrise were our of this world. Nice living room area with big table. Convenient for luggage and dining. Fantastic location and excellent value for money.